Terrorist shot dead by alert forces; no injuries in attempted stabbing. An Arab terrorist was shot dead by IDF forces after attempting to stab soldiers in the Tel Rumeida neighborhood of Hevron. According to initial reports the attacker did not succeed in harming anyone before being eliminated. Police and IDF forces have been dispatched to the scene. Hevron and the surrounding area has been one of the main focal points for stabbing attacks by Arab terrorists. 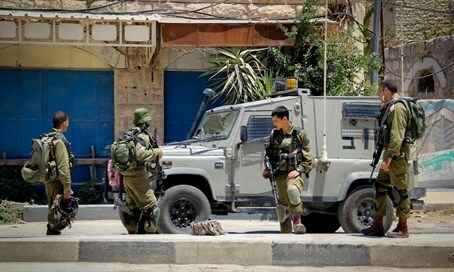 Yesterday (Tuesday), a terrorist was shot dead in identical circumstances, also in Tel Rumeida. Meanwhile, earlier Wednesday hospital officials announced a drastic improvement in the condition of a soldier seriously wounded in a stabbing attack near the Arab village of Bayt Einun near Hevron. The soldier was stabbed in the neck before his attacker was shot dead by his comrades. He was initially admitted to hospital in critical condition, but doctors say he is now out of danger and well on the way to recovery.